The Curved Magnet Frame, by Canetti, is made of two panels of solid acrylic, which are held together by tiny magnet points. 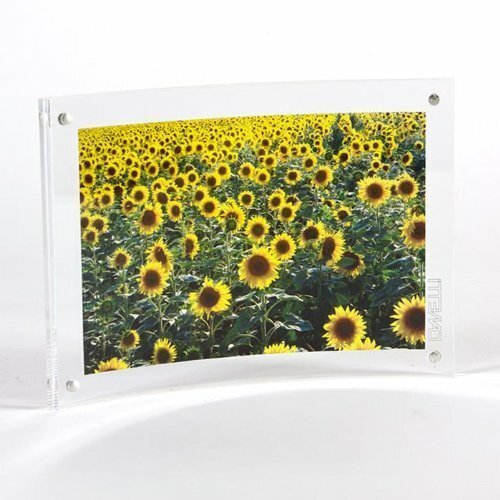 The panels are thinner than those in the Original Magnet Frame and have a slight curve, allowing the frame to stand up on its own. The picture is very easily placed between the two panels and is held securely with no additional hardware. Presented this way, the picture stands out clearly on its own, without any cumbersome frame around it. NOTE: The frame is the actual size and can hold a picture the same size as the frame itself, or a smaller one can be "floated" inside the frame. View More In Magnetic Frames. If you have any questions about this product by Canetti, contact us by completing and submitting the form below. If you are looking for a specif part number, please include it with your message.